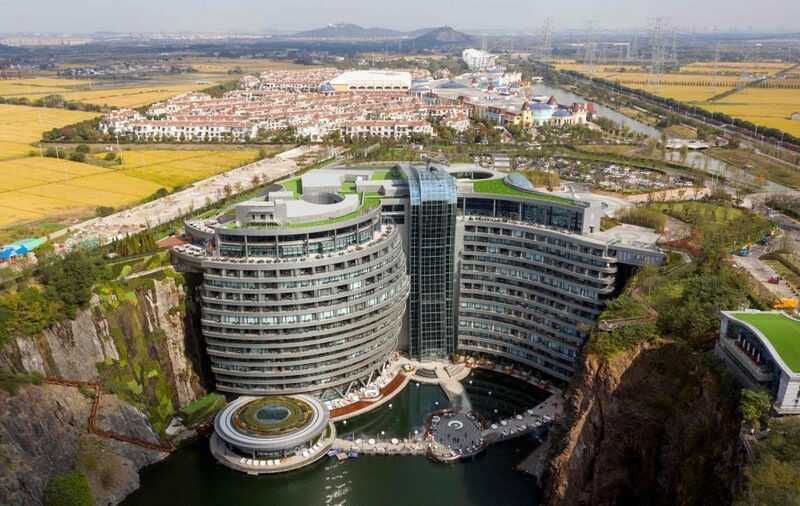 The world’s first “ground-scraper” resort hotel — plunging 88 metres into an old quarry on the fringes of Shanghai —has opened its doors to the public, reports ABC News. Built into the sidewall of a decommissioned quarry, the 18-storey Intercontinental Shanghai Wonderland two floors above ground and 16 below ground level, including two entire floors of underwater suites looking into a 10-metre deep aquarium. Guests on the other levels get panoramic views of a cascading glass waterfall and exposed rock on the opposite side of the quarry. Located 30 kilometres from Shanghai’s Hongqiao airport in the Sheshan Mountain Range, the 336-room hotel comes complete with sports and recreation facilities including rock climbing, kayaking, and bungee jumping. There’s also a nightly light show and, in a nod to the hotel’s location, a Quarry Bar. Rooms are priced from 3,394 yuan (A$668) a night, according to the Intercontinental Hotels and Resorts website, while the maximum price for a suite is more than a whopping A$14,000 and comes with butler service. However, no other hotels appear to be built in a former quarry or resemble a five-star luxury hotel. The project initially broke ground in 2012, but construction did not start until late 2013 and the project has been beset by several delays, notes The Urban Developer. The unique design has been honoured by multiple prestigious awards, including “Best Chinese Futura Projects Awards by MIPIM Asia 2011 as well as “Best Hotel Architecture China”, “Best Hotel Architecture Asia Pacific” and “Best International Hotel Architecture” by International Hotel Awards 2013.